Mr. Ray Cross Whitlock of Greensburg, Kentucky, son of the late Roscoe Whitlock and Alpha Lowe Whitlock, was born on Friday, September 28, 1928 in Green County and departed this life on Wednesday, September 19, 2018 at the Green Hill Rehab and Care Center. He was 89 years, 11 months, and 22 days of age. 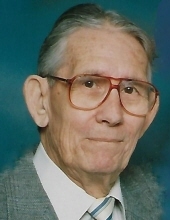 He had made a profession of faith in Christ, was a long time member of the Bethlehem Baptist Church, was a past Deacon and also served on the Bethlehem Cemetery Committee. He was retired from Fruit of the Loom, Inc. after 35 plus years, and was a member of the Fruit of the Loom Founders Club. He loved collecting arrowheads and doing wood working projects. He greatest joy was his family. He was also preceded in death by his wife of 67 years, Margie Lee Paxton Whitlock on June 15, 2015 having united in marriage on March 27, 1948. He was a devoted husband and caregiver for the last several years of Margie's life and they were known for their daily walks around Greensburg. Survivors include a daughter and son-in-law: Regina and Dennis Curry of Greensburg; a daughter-in-law: Laverne Whitlock Marple and her husband, Billy of Greensburg; six grandchildren: Carmen and Bryan Estes, Amanda and Matt Mills, Christopher and Laura Whitlock, Derek Curry and Brad Cash, Sean and Ashley Curry, and Whitney Curry and her fiancé, Kelvin Collett; two nieces: Rita Miller and Carol Beard both of Illinois; 10 great-grandchildren; five step-great-grandchildren; two great-great-grandchildren; eight step-great-great-grandchildren; and a host of other relatives and friends. Mr. Whitlock was also preceded in death by a son: Barry Whitlock on January 28, 2014; a sister and three brothers: Vetrie Beard, Destin Whitlock, Joe Whitlock, and Royce Whitlock. The family has asked that expressions of sympathy take the form of donations to the Bethlehem Cemetery Fund, or the Gideon Bible Fund, which can be made at the funeral home. To plant a tree in memory of Ray Cross Whitlock, please visit our Tribute Store. "Email Address" would like to share the life celebration of Ray Cross Whitlock. Click on the "link" to go to share a favorite memory or leave a condolence message for the family.